Once again, my best laid plans have gone a bit astray. Somehow I managed to come down with a raging cold on the day we departed for Sicily. That undoubtedly earned me the hotly contested title of the flight’s Most Hated Passenger as I coughed my way across the Atlantic Ocean. Ah well, one of the clear advantages of being older is you have learned to roll with whatever comes your way. Although, truth be told, there wasn’t much rolling, or any other kind of movement going on for the first two days we were in Palermo. I pretty much took to my bed, being unwilling to share whatever I had acquired with my fellow travelers. One definite advantage to group travel is Mike was able to enjoy sightseeing with the others while I rested up. By day 3 (Saturday), I was able to venture forth, so we decided to strike out on our own. Right by the opera house, we hopped aboard the free trolley, to one buggy driver’s disappointment. 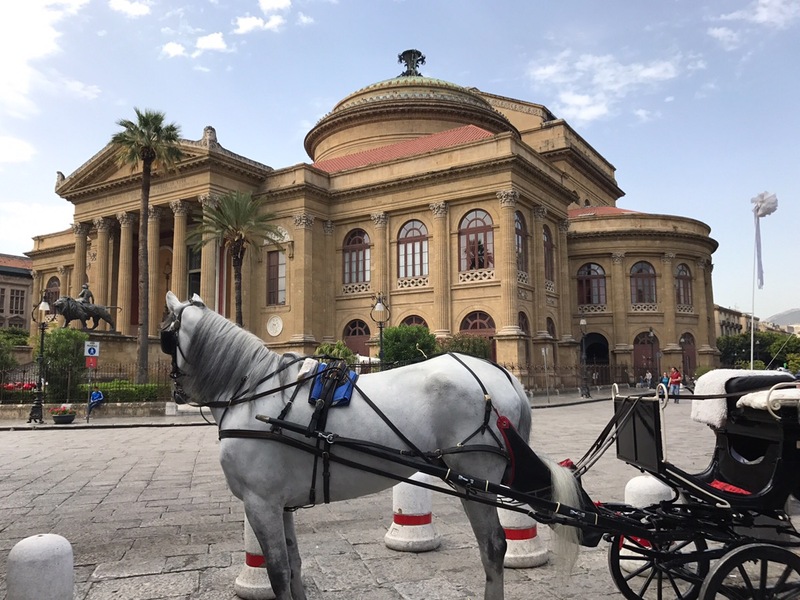 Pretty amazing that Palermo offers free transportation around the city to everyone! Our first stop was what is now known as the Norman Castle, which started out as an Arab fortress. In the 1100’s it became King Roger 2’s humble abode. King Roger 2 was quite an impressive guy. This Norman ruler managed to pull off what current world leaders haven’t been able to accomplish: Christians, Jews and Muslims coexisted in harmony during his reign, melding together the best of their cultures. The geometric designs in the ceiling of his bedroom have a definite Islamic flavor. This is one small section of a very elaborate design. I wonder if those gold mosaics glow in they dark. Does the beast in the center remind you of Maurice Sendak’s book ” Where the Wild Things Are”? I guess that’s one way to prevent your kids from crawling into bed with you. Now why didn’t WE think of that? To get to that royal apartment, you had to climb up several massive staircases. I counted 100 steps! No gym membership required for Roger. But he didn’t have to travel far for church services. 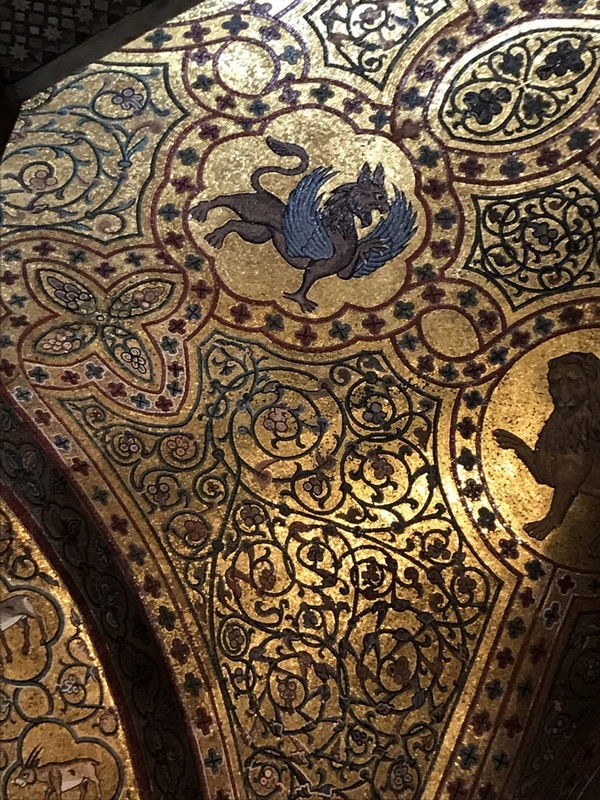 The Palatine Chapel is on the floor below, so he could roll out of bed and be at mass in less time than it took to place his crown on his head. 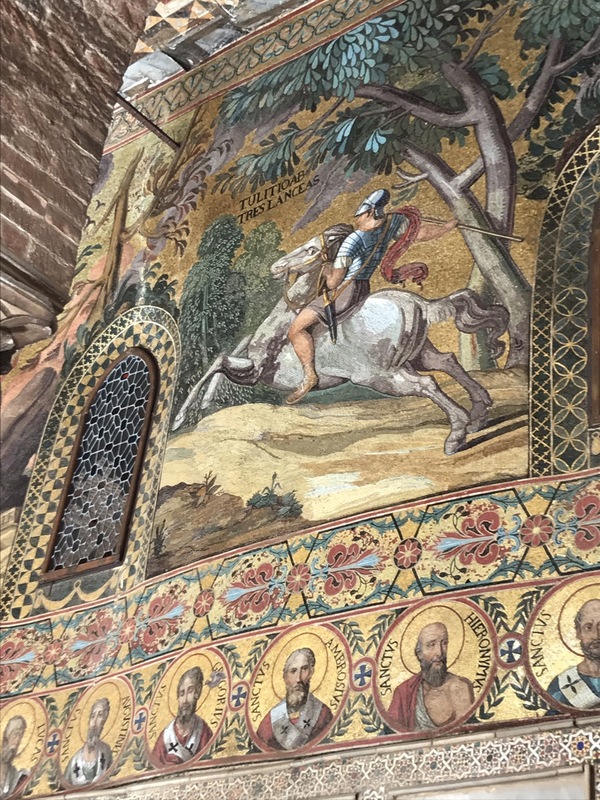 Like the Royal Apartment, the chapel is shiny and bright, with Christian and Muslim motifs covering every surface. At the start of our visit, we were approached by a woman who asked if we would like a free guided tour in English. 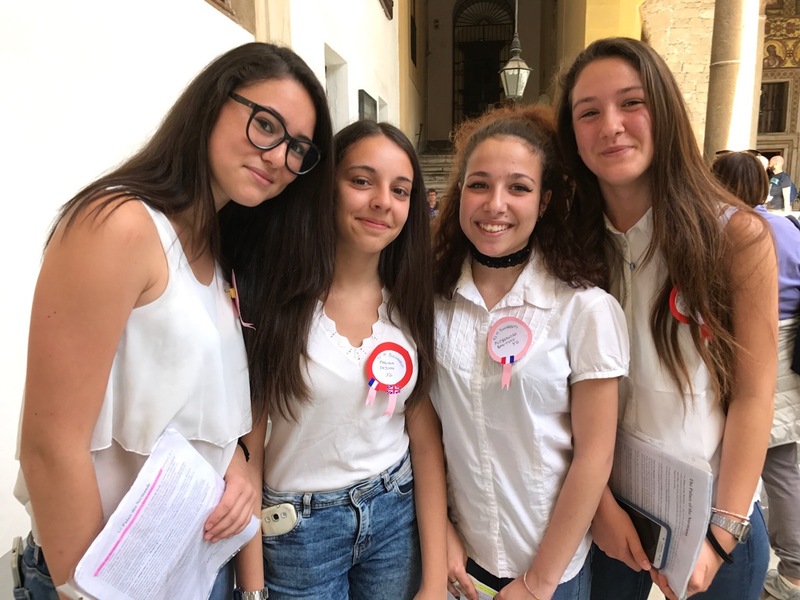 Her students, these four young girls, were eager to practice their English on us and earn extra credit. What a nice idea! The building has been remodeled multiple times over the years. The courtyard outside the chapel, for example, was redecorated around 1600. Pay close attention to the portraits on the bottom. They form a border around the perimeter of the courtyard. These were notable saints…every last one of them male. 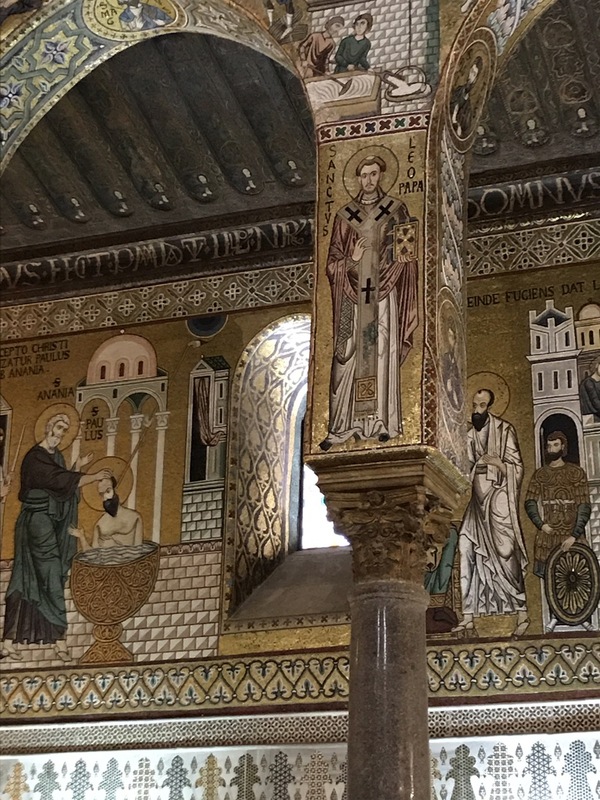 So, either there were no women saints deemed worthy of a spot on the wall OR women’s virtue was so taken for granted that it didn’t seem they had to put any effort into attaining sainthood. So why make a big deal about it? You decide which explanation rings true to you. Rather than go into culture overload, we decided not to overdo it, so headed back to rest up before dinner at Vino y Pomadoro, a wonderful restaurant close to our hotel. The menu had English “subtitles” so I was very relieved. I have this fear that I would accidentally order something that would horrify me, like pizza with rabbit and horseradish. Here’s what I got. I’m sorry that you had to miss a couple of days touring, but it looks like you made up for lost time! Beautiful pictures and yummy-looking pizza. The upside of being sick for a couple of days? it’s going to take longer for my pants to feel tight. Would love to go there some day! Thanks for the delightful travelogs. Like the New Zealand trip, we are lucky to have great traveling companions. It’s a much smaller group, though. Just 16 of us. Glad you have recovered. 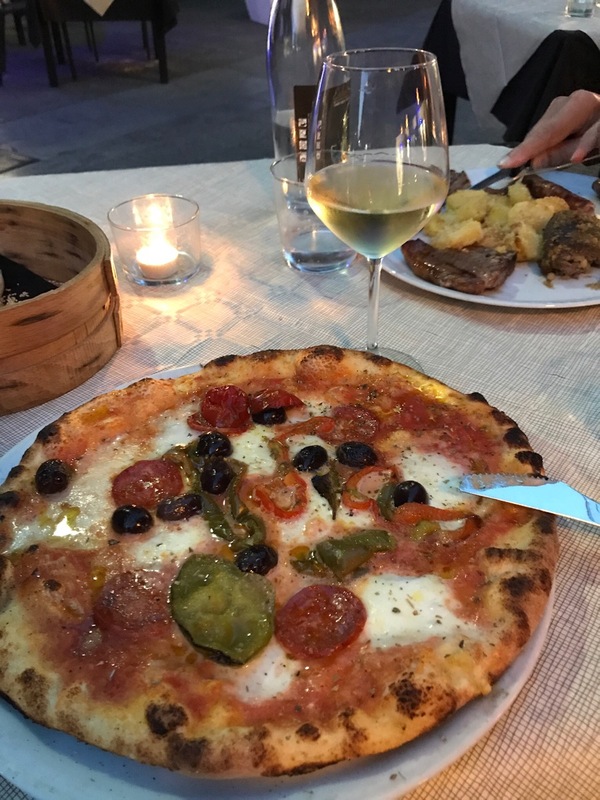 Your photos are gorgeous…and that pizza makes me hungry. As always….your blog is enlightening and entertaining. I’m so sorry to had to start your trip feeling unwell. I wondered what was going on when no blog posts arrived after May 3rd! Thanks for an excellent Chapter 1. Have fun!